It also includes ascorbic acid, niacin, vitamins B3, B5 and B12, zinc, sodium bicarbonate and potassium bicarbonate. To create the supplement, the greens go through a simple process of dehydration with no enzymatic or chemical breakdown of ingredients. It is free of:wheat, gluten, sugars, allergens, dairy, preservatives, and salt. How to Use:Drop one tablet in eight ounces of water, dissolve and drink. Take a maximum of three tablets per day for adults and two tablets per day for those under age 18. If you're pregnant or nursing, consult your health practitioner prior to taking. Haven't been sick since I started taking them, even with 2 small children. Cant live without it. Take 1 everyday! I tried a sample in store, and it reminds me a summer cocktail- surprisingly tasty and refreshing! I love how easily it dissolves into a bottle of water. 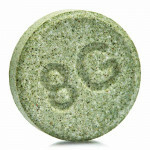 I travel a lot so it's nice to take with me and make sure I'm getting my "greens"
8G tastes great! I occasionally put in sparkling water for a healthy “cocktail”! Even my 13 year old loves these! This gives me the greens intake that I otherwise wouldn't get. I like the taste and look forward to drinking it daily. so far just tried it once, it had a good taste that I was not expecting. kinda of like a fizzy lemon taste. I love this product. I can feel the difference. I eat pretty healthy but being 54 years old you have to be proactive. 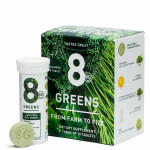 These green tablets keep me on track and my health, hair and skin are like that of a 30 year old. I love this product. The taste is good and it’s so convenient. I am in remission from leukemia and my blood work is beautiful! Wow. I absolutely love these! They have a pleasant smell and taste (which I was not expecting), and they give me a quick boost of energy to help me last through the day. these greens boosters are awesome!! i especially like to use this supplement after the gym to reinvigorate my body and add nutrients back. i always forgot to eat sufficient veggies daily, but this 8greens changed my life! 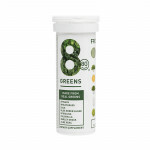 help boosting my daily greens intake and love the taste!